Frustrated with Your Sales Results? Many people in our industry feel stuck. Stuck in a rut. Stuck at a certain level of sales. Stuck in a sales plateau. Only a small percentage ever reach $1,000,000 a year in gross sales. And a smaller percentage than that ever exceed it. Maybe you have yet to reach your desired level of sales. Maybe you reached some of your initial sales goals, but struggle to get the rest of the way. Maybe you just want to have more without having to do a whole lot more. In fact, very often, achieving a dramatic sales increase is not a matter of having to do more things. Instead, it’s a simple matter of doing things differently. So what do you have to do differently and better to generate one million, three million, even ten million dollars in annual promotional products sales? Is it Something that Can be Replicated? It was the first and only time these million dollar plus producers had ever been together in the same room — and never before had they agreed to share their secrets. Learn the Specific Actions Required to Become a Multi-Million Dollar Producer! Every human being has the same number of hours in each day. Twenty four hours is fixed. It’s inflexible. Therefore, the people who generate over a million dollars in sales each year have specific ways of making their time count for much more than those who earn less. What are those ways? What, specifically are they doing? How do they prioritize their work? How do they decide what to do and what not to do? What percentage of their time is spent with new clients vs. existing clients? What is an ideal day like? How does that differ from a typical day? Million Dollar Prospecting, Positioning, Daily Habits… This Group Even Talks About Gross Profits! Probe the lead generation and prospecting habits of multi-million dollar producers. What are their primary methods of prospecting? What is their most effective method? What types of clients do they target and how, specifically, do they target them? Explore the way that million dollar producers position themselves in their markets, the primary message they each try to convey to their prospects and clients about themselves and their businesses. How this differs from when they were first starting out and what the perception is about each of them among both their clients and their competitors. WOW! Thanks for sharing your insight and secrets to your success. This is full of great advice and experiences. I have all your material and this is the best yet! Find out about their daily habits… the most important activities they do themselves and the most important activities they had to learn to delegate. We’ll also talk numbers… in terms of the number of clients required to get to the level of sales they’ve achieved, the average order size, frequency of purchase, even gross profit margins and the critical, but often overlooked risk to reward ratio on each order. Investigate the communication procedures of million dollar producers, their primary methods of contacting clients, how often they contact them, what reasons they use to get in touch… and what excuses they use as well! We’ll tackle the importance of creating a reliable supplier network, how they choose and replace suppliers when necessary and how they manage all those supplier solicitations. Naturally, we’ll discuss products… which categories do well and which specific items have worked for them. In addition to the live summit, you’ll also get brand new, never-before-offered material, all about how to become a multi-million dollar producer. It’s approximately six hours of material, along with your confidential workbook and extra bonuses, worth their weight in gold! Last week I was at a Chamber of Commerce meeting for new member businesses in my area. Each new member had the opportunity to give their 30 second infomercial I used information from the Top Secrets program in my 30 seconds. After the meeting I was approached by five new prospects, including the event coordinator of a major government funded charity organization. This package is worth every penny and more, with lots of easy to apply strategies. Everything You Always Wanted to Know About Multi-Million Dollar Producers, but Were Afraid to Ask! BONUS 1: Our Exclusive, Top Secrets Behavior Modification Grid. Becoming a multi-million dollar producer requires changing our habits. With this unique tool, you'll be able to track your progress daily and see where you are successfully taking action and where you need more help. BONUS 2: Our Exclusive, Top Secrets Project Management Sheets. When important projects seem too big and overwheming to tackle, they very often don't get done. These project management sheets allow you to quickly and easily break important projects down into manageable, "bite-sized" tasks, so you can begin immediately! BONUS 3: The Ultimate Industry Needs Analysis. True consultative selling requires an ability to ask clients intelligent, probing questions that reveal their true needs and objectives. In the Ultimate Industry Needs Analysis, you'll get over 100 focused questions that you can ask clients to lead the discussion, demonstrate your expertise and help your clients to achieve the results they're looking for in their businesses. 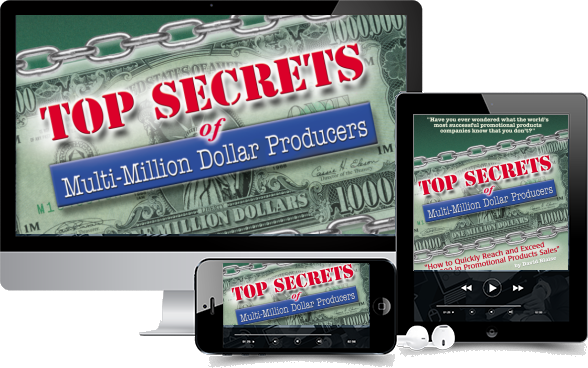 Top Secrets of Multi-Million Dollar Producers: How to Quickly Reach & Exceed $1,000,000.00 a Year in Promotional Products Sales. I can order Top Secrets of Multi-Million Dollar Producers today and implement the strategies risk-free in my business for one full year. If, at the end of that time, I have not made or saved at least ten times the cost of the system, in additional sales or bottom line savings, I can complete the document destruction form and receive a complete refund. If you’ve been exposed to our emails, podcasts, videos or live training, you have some idea of what Top Secrets of Multi-Million Dollar Producers can do for you. Why not put the power of this proven Success System to work for you right now?